BNP Paribas S.A. is a French international banking group. It is the world's 8th largest bank by total assets, and currently operates with a presence in 77 countries. It was formed through the merger of Banque Nationale de Paris (BNP) and Paribas in 2000, but has a corporate identity stretching back to its first foundation in 1848 as a national bank. It is one of three major international French banks, along with Société Générale and Crédit Agricole. The group is listed on the first market of Euronext Paris and a component of the Euro Stoxx 50 stock market index, while it also included in the French CAC 40 index. With both a retail banking section and investment banking operations, the bank is present on five continents. Its retail banking networks serves more than 30 million customers in its three domestic markets, France, Belgium and Italy through several brands such as BNL and Fortis. The retail bank also operates in the Mediterranean region and in Africa. In the Americas, it operates in the western United States as Bank of the West and is Hawaii's most important banking group through its majority-owned subsidiary First Hawaiian Bank. As an investment bank and international financial services provider for corporate and institutional clients, it is present across Europe, the Americas, and Asia. 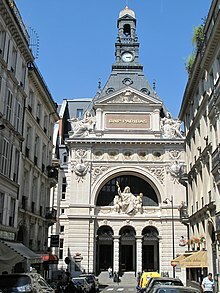 The Banque Nationale de Paris S.A. (BNP) resulted from a merger of two French banks – Banque nationale pour le commerce et l'industrie (BNCI) and Comptoir national d'escompte de Paris (CNEP) – in 1966. The Banque de Paris et des Pays-Bas S.A. (Bank of Paris and the Netherlands), or Paribas, was formed from two investment banks based respectively in Paris and Amsterdam, in 1872. Les Pays-Bas ("The Low Countries") is French for the Netherlands. In May 2000, BNP and Paribas merged to form BNP Paribas, which is thus descended from four founding banking institutions. On 7 March 1848, the French Provisional Government founded the Comptoir national d'escompte de Paris (CNEP) in response to the financial shock caused by the revolution of February 1848. The upheaval destroyed the old credit system, which was already struggling to provide sufficient capital to meet the demands of the railway boom and the resulting growth of industry. The CEP grew steadily in France and overseas, although in 1889 there was a crisis in which it was temporarily placed in receivership. Separately, on 18 April 1932, the French government replaced Banque nationale de crédit (BNC), which failed as a result of the 1930s recession, with the new bank Banque nationale pour le commerce et l'industrie (BNCI). The former banks headquarter and staff were used to create BNCI with fresh capital of 100 million francs. The bank initially grew rapidly through absorbing a number of regional banks that got into financial trouble. After the Second World War, it continued to grow steadily. It grew its retail business in France and its commercial business overseas in the French colonial empire. After the end of the Second World War, the French state decided to "put banks and credit to work for national reconstruction". René Pleven, then Minister of Finance, launched a massive reorganization of the banking industry. A law passed on 2 December 1945 and which went into effect on 1 January 1946 nationalized the four leading French retail banks: Banque nationale pour le commerce et l'industrie (BNCI), Comptoir national d'escompte de Paris (CNEP), Crédit Lyonnais, and Société Générale. In 1966, the French government decided to merge Comptoir national d'escompte de Paris with Banque nationale pour le commerce et l'industrie to create one new bank called Banque Nationale de Paris (BNP). The bank was re-privatised in 1993 under the leadership of Michel Pébereau as part of a second Chirac government's privatization policy. Banque de Paris et des Pays-Bas (Paribas) was established on 27 January 1872, through the merger of Banque de Crédit et de Dépôt des Pays-Bas, which had been established in 1820 by Louis-Raphaël Bischoffsheim in Amsterdam, and Banque de Paris, which had been founded in 1869 by a group of Parisian bankers. It went on to develop a strong investment banking business both domestically in France and overseas. During the period 1872 to 1913, it was involved in raising funds for the French and other governments as well as big businesses through a number of bond issues. It helped the French government raise funds during the First World War and raised further capital and expanded into investments into industrial companies during the Great Depression. It stagnated and lost assets during the Second World War. After World War II, it missed the nationalisation of the other French banks due to its status as an investment bank and managed to take advantage of that by expanding its operations overseas. It also directs its activity towards businesses and participates in the development and restructuring of French industry, including names such as Groupe Bull and Thomson-CSF. The bank was nationalized in 1982 by the government of Pierre Mauroy under François Mitterrand as part of a law that nationalized five major industrial companies, thirty-nine registered banks, and two financial companies, Suez and Paribas. It was re-privatized in January 1987 by the Chirac government. In the 1990s, Paribas had an active policy of acquisitions and divestiture. This included selling the Ottoman Bank to Doğuş Holding, and setting up the joint venture lending company Cetelem in Germany. It sold Crédit du Nord to Société Générale and in 1998 it merged with Compagnie Bancaire, renaming the bank with the official name Compagnie Financière de Paribas. In 1999, BNP and Société Générale fought a complex battle on the stock market, with Société Générale bidding for Paribas and BNP bidding for Société Générale and counter-bidding for Paribas. BNP's bid for Société Générale failed, while its bid for Paribas succeeded leading to a merger of BNP and Paribas one year later on 23 May 2000. On 9 August 2007, BNP Paribas became the first major financial group to acknowledge the impact of the sub-prime crisis by closing two funds exposed to it. This day is now generally seen as the start of the credit crisis and the bank's quick reaction saved it from the fate of other large European banks such as UBS. On 14 December 2008, BNP announced it could lose €350 million as a victim of the Madoff fraud. In the end of January, the Belgian government and BNP negotiated for a 75% partnership in Fortis Bank Belgium. Fortis Insurance Belgium would be reintegrated in Fortis Holding. On 11 February, Fortis' shareholders decided that Fortis Bank Belgium and Fortis Insurance Belgium should not become property of BNP Paribas. However the acquisition was completed and BNP Paribas took 75% share holding and renamed the new subsidiary BNP Paribas Fortis. After this only Fortis Insurance International was left in Fortis Holding and this was renamed as Ageas, a business that had Insurance all over Europe and Asia. The remaining Fortis Bank Netherlands was in the hands of the Dutch Government which merged it with other ABN AMRO holdings it already owned under the name ABN AMRO. In May 2009, BNP Paribas became the majority shareholder (65.96%) of BGL (formerly Fortis Bank Luxembourg), the State of Luxembourg retaining 34% making BNP the eurozone's largest bank by deposits held. On 21 September, the bank's registered name was changed to BGL BNP Paribas and in February 2010, BGL BNP Paribas became the 100% owner of BNP Paribas Luxembourg. The transfer was finalised on 1 October 2010 with the incorporation of BNP Paribas Luxembourg's business in the operational platforms of BGL BNP Paribas. In 2013 BNP Paribas was awarded the Bank of the Year award by The International Financing Review ("IFR"), Thomson Reuters' leading financial industry publication. The IFR awards are a key industry benchmark and Bank of the Year is the top honour awarded. BNP Paribas reached an agreement in December 2013 to acquire Rabobank's Polish unit BGZ Bank for around $1.4 billion. In September 2014, BNP completed the purchase of BGZ Bank for a final fee stated in the media to be $1.3 billion. In June 2014, BNP Paribas pleaded guilty to falsifying business records and conspiracy, having violated U.S. sanctions against Cuba, Iran, and Sudan. It agreed to pay an $8.9 billion fine, the largest ever for violating U.S. sanctions at that time. The BNP Paribas logo since 2000 (designed by Laurent Vincent under the leadership of the Communications Director, Antoine Sire) is called the "courbe d'envol" (curve of taking flight). The stars allude to Europe and universality. The transformation of the stars into birds conveys openness, freedom, growth, and the ability to change and adapt. The shape and movement of the curve places the logo in the universe of life. The green square symbolises nature and optimism. Retail Banking & Services, a global network of nearly 7,000 branches, comprising Domestic Markets and International Financial Services, and Corporate & Institutional Banking (CIB). At the end of 2015, outstanding deposits stood at EUR700.3 billion and outstanding loans at EUR682.5 billion. The geographic breakdown of revenues was as follows: Europe (73.3%), Americas (11.8%), Asia Pacific (7.5%) and others (7.4%). Retail banking is BNP Paribas' largest business unit representing 72% of its 2015 revenues. Its operations are concentrated in Europe, especially in the group's three domestic markets of France, Italy (where it operates as Banca Nazionale del Lavoro (BNL)), and Belgium (as BNP Paribas Fortis). The group also owns an American subsidiary BancWest which operates as Bank of the West in the western United States and First Hawaiian Bank in Hawaii. BNP Paribas's Europe Mediterranean group also runs large retail banks in Poland, Turkey, Ukraine, and northern Africa. BNP Paribas is the largest bank in the Eurozone by total assets and second largest by market capitalization according to The Banker magazine, just behind Banco Santander. It employs over 189,000 people, according to the bank as of 31 December 2015, of which 147,000 work in Europe, and maintains a presence in 75 countries. Italy: In 2006 BNP Paribas purchased Banca Nazionale del Lavoro (BNL), Italy's sixth largest bank at the time. In 2009 BNL had 810 branches in Italy, 2.5 million individual clients, and over 150,000 corporate clients. It grossed €2.9 billion in revenue (7.2% of the total group's) and €540 million of net income (9.3% of the total group's), and employs around 13,000 employees (6.5% of the total group's). Belgium: BNP Paribas acquired BNP Paribas Fortis when it acquired the retail banking assets of the Belgian lender Fortis in 2009. This deal also included Fortis's subsidiaries in Poland and Turkey, now grouped in the "Europe Mediterranean" division. In the United States, BNP Paribas owns BancWest, which in turn operates retail banking subsidiaries Bank of the West and First Hawaiian Bank. Bank of the West operates in 19 Western US states (where it ranks as the 7th largest foreign bank by assets), while First Hawaiian is Hawaii's leading bank with a 40% market share in deposits. Together the two banks operate 710 branches, and service 5 million clients. The two banks were merged into BancWest in 1998, and BNP Paribas took full control of the combined entity in 2001. The group has a strong presence on niche markets such as lending for marine and recreational vehicles, church lending, and agribusiness. In 2009 BancWest had €2.1 billion in revenues (5.2% of the total group's), and 11,200 employees (5.5% of the total group's headcount). BancWest lost €223 million in 2009 largely due to its exposure in the subprime mortgage crisis in California, Arizona, and Nevada. In 2009, BNP Paribas reorganized its retail banking divisions renaming its "Emerging Markets" group the "Europe Mediterranean" group. This change was made because after the integration of Fortis Bank's Polish and Turkish subsidiaries, BNP Paribas's emerging market activities are now heavily concentrated in Eastern Europe and the southern half of the Mediterranean basin. BNP Paribas is a member of the Global ATM Alliance, a joint venture of several major international banks that allows customers of the banks to use their ATM card or check card at another bank within the Global ATM Alliance with no ATM surcharges when traveling internationally. Other participating banks are Barclays (United Kingdom), Bank of America (United States), China Construction Bank (China), Deutsche Bank (Germany), Santander Serfin (Mexico), UkrSibbank (Ukraine), Scotiabank (Canada) and Westpac (Australia and New Zealand). In addition to its retail activities, BNP Paribas is also a leading global investment bank through its Corporate & Institutional Banking unit. Although present in all investment banking markets, it is recognized as a global leader in derivatives trading, structured finance, and project finance. Fixed Income: BNP Paribas' fixed income team helps companies hedge their exposure to foreign exchange, interest rate, and credit risks, primarily though the structuring and sale of derivative products such as interest rate and foreign exchange swaps, foreign exchange options and credit derivatives. It also trades in these markets on behalf of clients or for its own proprietary account. On an average day, a quarter of a trillion dollars in fixed income instruments are traded at BNP Paribas Americas' fixed income trading floor located just blocks from the NASDAQ MarketSite in Manhattan, New York City. Equity & Derivatives: BNP Paribas' Equity & Derivatives team helps companies manage their risks and investment portfolios with equity derivatives such as options, futures, and swaps, as well as highly complex, customized solutions such as structured products. It also trades in these markets on behalf of clients or for its own proprietary account. Commodity Derivatives: BNP Paribas' Commodity Derivatives team helps clients hedge their exposure to commodity risk though the structuring and sale of commodity futures and OTC commodity swaps. It also trades in these markets on behalf of its clients or proprietary account. Investment Banking: BNP Paribas' Corporate Finance team performs most of the traditional investment banking functions of the group including mergers and acquisitions advisory, and equity raising operations such as Initial Public Offerings (IPOs), rights issues, and convertible bond issues. Structured Finance: BNP Paribas' Structured Finance group offers clients project finance solutions, export financing, syndicated loans, and financing for acquisitions and leveraged buyouts. Corporate & Transaction Group: BNP Paribas' Corporate and Transaction group offers clients simplified flow banking services including trade finance, international cash management, and basic hedging solutions. BNP Paribas's "Investment Solutions" unit includes its asset management, custodial banking, real estate, insurance, electronic trading platform, "Personal Investors" and wealth management activities. On 11 June 2008, BNP Paribas formally signed an agreement to purchase the Prime Brokerage Services division of Bank of America Securities. The sale was expected to be completed by the end of the 2008 third quarter. Asset Management: The asset management activities of BNP Paribas are grouped under BNP Paribas Investment Partners. In 2009 BNP Paribas IP had 2,400 employees in more than 70 countries and US$395.1 billion in assets under management (AuM) in 2014 according to the Scorpio Partnership, an increase of 11% over 2013. On 23 September 2005, BNP Paribas was set to take a 20 percent stake in China's Nanjing City Commercial Bank, a Chinese official and state press reports said. "BNP is going to sign a deal with us to buy a stake next month," an official from Nanjing City Commercial told AFP. The Shanghai-based Oriental Morning Post said BNP would pay up to US$100 million, although the bank official said the figure was incorrect. He declined to give further details. The French newspaper La Tribune reported in August 2005 that BNP Paribas had talked to four Chinese commercial banks—Ningbo, Wuxi, Nanjing and Suzhou—and was prepared to invest US$50–100 million. "We've talked to different financial institutions, but only BNP showed its good faith. It was not easy for us to reach an agreement," the Nanjing City Commercial Bank official said. BNP Paribas refused to comment. The International Financial Corporation, the investment arm of the World Bank, already owns 15 percent of Nanjing City Commercial Bank, which has regulatory approval to list on the country's domestic stock markets. In 2016 BNP reached a $40m settlement with a Jewish employee. Before, the employee was made to watch a training video. The film portrayed Adolf Hitler as the CEO of Deutsche Bank, one of BNP's competitors and the Nazi soldiers around him as Deutsche Bank executives. The video showed Hitler screaming at the soldiers. Also, his colleagues made a number of anti-semitic comments during his time at BNP Paribas. In 2010 the French government's Autorité de la concurrence fined BNP and 10 other banks €384 million for colluding to charge unjustified fees on check processing, including extra fees during the transition from paper check transfer to "Exchanges Check-Image" electronic transfer. On 19 January 2011 BNP sued Russian grain trader, OOO Rosinteragroservis, and its subsidiary OAO Kubankhlebprodukt, claiming US$20 million in debts and penalties. BNP Paribas is the biggest investor in the nuclear sector as a bank, according to Profundo, with more than €13.5 billion in nuclear investments. On 23 October 2011 Greenpeace organised a protest against BNP Paribas in 24 French cities. On 30 May 2014, The Wall Street Journal reported that the United States Department of Justice was negotiating a possible guilty plea with BNP Paribas as well as the size of the resulting fine for violating U.S. regulations and evading US sanctions. The Justice Department sought a fine of more than US $10 billion, which was expected to be reduced to $8 or $9 billion in negotiations. BNP Paribas was said to have laundered up to US$100 billion from the sanctioned countries of Sudan, Iran, and Cuba. On 1 July 2014, BNP Paribas pled guilty in a New York state court to falsifying business records as well as conspiracy in connection to those falsifications. It is also expected to plead guilty in federal court to violating laws against money-laundering. It agreed to pay $8.9 billion, the largest fine ever for violating U.S. sanctions, and substantially more than the previous record of $1.9 billion. BNP Paribas was also barred for one year under the plea agreement from certain US dollar-dominated transactions. The fine exceeded the bank's $6.4 billion 2013 annual income and the $1.1 billion it previously had allocated for the anticipated fine. The bank's failure to cooperate with the multi-year investigation was given as a significant factor in the size of the fine. Additionally, BNP Paribas continued to process sanctioned transactions after the investigation began. About 30 employees left the bank as a result of the investigation. According to the FBI's New York Field Office and Chief Richard Weber of the Internal Revenue Service-Criminal Investigation (IRS-CI) "BNPP deliberately disregarded the law and provided rogue nations, and Sudan in particular, with vital access to the global financial system, helping that country's lawless government to harbor and support terrorists and to persecute its own people. Today's sentence demonstrates that financial institutions will be punished severely but appropriately for violating sanctions laws and risking our national security interests." After the fine was announced, BNP said it would be "just fine" and that it had "a comprehensive plan" to avoid similar violations in the future. The company's stock, which had fallen 12% since news of the investigation first leaked, rose 4% on the announcement. To comply with the transaction ban, BNP Paribas will use a third party to clear its US transactions. Standard & Poor's said it was reviewing the bank's financial standing[when?] in light of the fine and penalties for a possible downgrade. Russian president Vladimir Putin alleged without providing any supporting evidence that the US government was using the case to punish France for selling Mistral amphibious assault ships to Russia. He said the large fine and the imposition of sanctions on the French bank were the result of US displeasure with France's decision not to stop the sale. Former European Central Bank president Jean-Claude Trichet had previously said that a large fine was neither fair nor proportionate to the violations and could disrupt the global banking system. The German FAZ, FOCUS, Bloomberg and the French Les Echos newspaper published an article regarding a 152 Million EUR mistrade (erroneous trade) in which BNP Paribas Arbitrage is allegedly involved. The bank has sold securities for 326,400 EUR to the investor Armin S. but the value of the securities is 163 Million EUR according to the bank. According to the article, the error remained unnoticed for several days. BNP has even reconfirmed the original price. However, a trade-cancellation was only possible until the next day according to prevailing erroneous trade rules. Michael Lusk published an article regarding this case with the title "Do banks' internal control system work?" The lawyer of Armin S., Mario Bögelein stated in the article that a bank not recognizing an error of this magnitude should not be protected by law. Armin S also filed a claim for 152m EUR in Paris because the relevant juristiciton is still unknown. BNP Paribas has been a major sponsor of tennis. In 1973 it became the major sponsor of the French Open, one of the four prestigious Grand Slam tournaments in the sport. In 2001 the bank began to sponsor the Davis Cup before becoming the title sponsor in 2002. In 2002 it became the sponsor of the Paris Masters, an ATP World Tour Masters 1000 tournament. In 2008 it because the sponsor of the BNP Paribas Primrose Bordeaux, an ATP Challenger Tour tournament. The company's sponsorship expanded to the United States in 2009 when it became the title sponsor of the Indian Wells Masters, an ATP World Tour Masters 1000 two-week tournament in California. It also sponsored the BNP Paribas Showdown and BNP Paribas Tennis Classic exhibition tournaments held in New York City and London respectively. It sponsored the. The Stanford Classic, since 1992, is instead directly sponsored by the Bank of the West subsidiary. Under the aegis of the Fondation de France, the BNP Paribas Foundation has been playing a key role in corporate philanthropy for more than 30 years. It is also encouraging to developing the BNP Paribas international philanthropic policy where the Group does business. The Environmental research: support to laboratories in France, in Europe and on an international collaboration so as to implement the research projects on climate change. Help to Help, a programme that promotes the Group staff initiative as volunteers. In 2015, BNP Paribas Corporate Philanthropy in the world represented a commitment of almost 40 million euros. In 2015, Standard Ethics Aei has given a Sustainability Rating to BNP Paribas (EE+) in order to include it in its Standard Ethics French Index. ^ "BNP Paribas board chooses Jean Lemierre as new chairman". Reuters. 26 September 2014. Archived from the original on 2 April 2015. Retrieved 12 March 2015. ^ a b c d e "2017 Full Year Results" (PDF). BNP Paribas. Retrieved 26 June 2018. ^ "Annual Report 2015" (PDF). BNP Paribas. Archived (PDF) from the original on 20 August 2016. Retrieved 19 August 2016. ^ "About us". mabanque.bnpparibas/. BNP Paribas official website. Archived from the original on 23 November 2017. Retrieved 22 November 2017. ^ "Constituents". boerse-frankfurt.de. Archived from the original on 19 November 2015. ^ "How BNP Paribas Became One of the World's Biggest Banks - SBNN". SBNN. 12 September 2017. Archived from the original on 19 March 2018. Retrieved 18 March 2018. ^ a b "FBI — Bank Guilty of Violating U.S. Economic Sanctions". Fbi.gov. Archived from the original on 15 July 2014. Retrieved 14 July 2014. ^ "These are the 23 biggest global banks — all with more than $1 trillion of assets". Business Insider France (in French). Archived from the original on 4 May 2018. Retrieved 18 March 2018. ^ "BNP Paribas Group History". International Directory of Company Histories. St James Press. 36. 2001. Archived from the original on 4 April 2017. ^ "The BNP Paribas Group - History of the Group". BNP Paribas. Archived from the original on 14 September 2013. Retrieved 15 February 2013. ^ Harry Wilson (3 August 2010). "BNP Paribas makes first asset write back since 2007". The Telegraph. London: www.telegraph.co.uk. Archived from the original on 21 November 2011. Retrieved 6 April 2011. ^ Morning Zhou (9 August 2007). "Asian stocks may fall on credit woes, global sell-off". Market Watch. Archived from the original on 7 June 2011. Retrieved 6 April 2011. ^ "BNP-Paribas rachète Fortis en Belgique et au Luxembourg". Le Monde. Reuters. 6 October 2008. Retrieved 6 April 2011. ^ "Aandeel Fortis blijft geschorst". De Morgen. 14 December 2008. Retrieved 6 April 2011. ^ "Affaire Madoff: BNP Paribas pourrait perdre 350 millions d'euros". Le monde. 14 December 2008. Archived from the original on 15 December 2008. ^ Reed Stevenson (29 April 2009). "Fortis asset sale to BNP cleared with Dutch OK". Reuters. Retrieved 30 April 2009. ^ Mullin, Keith. (15 February 2012) Bank of the Year: BNP Paribas | All Special Reports Archived 16 December 2012 at the Wayback Machine. IFRe. Retrieved on 6 December 2013. ^ BNP Paribas digs deep at charity auction Archived 28 January 2013 at the Wayback Machine. Efinancialnews.com. Retrieved on 6 December 2013. ^ International banking, finance, capital markets news & analysis | Euromoney magazine Archived 13 December 2013 at the Wayback Machine. Euromoney.com. Retrieved on 6 December 2013. ^ Marcin Goclowski (5 December 2013). "BNP Paribas agrees to buy Polish Rabobank unit for $1.4 billion". Reuters. Archived from the original on 24 September 2015. ^ a b Protess, Ben and Jessica Silver-Greenberg (30 June 2014). "BNP Paribas Admits Guilt and Agrees to Pay $8.9 Billion Fine to U.S." The New York Times. Archived from the original on 30 June 2014. Retrieved 1 July 2014. ^ "BNP Paribas (A) Bilanz, Gewinn und Umsatz | BNP Paribas (A) Geschäftsbericht | 887771". wallstreet-online.de. Retrieved 5 November 2018. ^ a b c d e "Annual Registration Document 2009". BNP Paribas. 11 March 2010. Archived from the original on 2 August 2010. Retrieved 17 April 2010. ^ "Five big banks form Global ATM Alliance". ATMmarketplace.com. 9 January 2002. Archived from the original on 7 May 2007. Retrieved 22 June 2007. ^ "NY Trading Floor BNP Paribas". cnbc. February 2011. Archived from the original on 19 July 2011. Retrieved 6 April 2011. 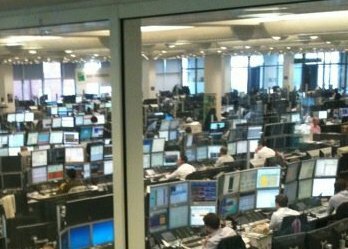 ^ "London Trading Floor BNP Paribas". bnp paribas. February 2011. Archived from the original on 21 March 2011. Retrieved 6 April 2011. ^ a b "Global Private Banking Benchmark 2014 - Scorpio Report". Archived from the original on 18 October 2015. ^ "BNP Paribas - Legal Information". www.bnpparibas-pf.co.uk. Archived from the original on 29 January 2018. Retrieved 4 May 2018. ^ "Leasing Solutions". PNB Paribas. 2010. Archived from the original on 26 February 2011. Retrieved 6 April 2011. ^ "Arval". PNB Paribas. Archived from the original on 29 January 2011. Retrieved 6 April 2011. ^ "bnpparibas-personalinvestors.lu". bnpparibas-personalinvestors.lu. 1 January 1970. Archived from the original on 19 December 2014. Retrieved 14 July 2014. ^ "Protection Habitat". bnp-paribas. 1 January 1970. Archived from the original on 7 November 2016. Retrieved 4 November 2016. ^ "Protection 24". protection-24. 1 January 1970. Archived from the original on 20 October 2016. Retrieved 4 November 2016. ^ Ain, Stewart (4 May 2016). "$40M Lawsuit Over Bank's Nazi-Themed Training Video". jewishweek.timesofisrael.com. Archived from the original on 4 February 2018. Retrieved 4 February 2017. ^ Simao, Oliver (24 May 2016). "BNP Paribas reaches settlement over offensive Hitler parody video in training sessions" (PDF). Archived (PDF) from the original on 4 February 2018. Retrieved 4 February 2017. ^ Marina Sysoyeva (19 January 2011). "Bnp Paribas Sues Russian Grain Trader Rias, Seeking $20 Million". Bloomberg.com. Archived from the original on 12 April 2012. Retrieved 6 April 2011. ^ "STOP Nucléaires, 23 Octobre : Journée nationale de mobilisation!". STOP Nucléaire. Archived from the original on 4 June 2011. Retrieved 20 July 2011. ^ Kevin Dugan (4 June 2014). "BNP Paribas probed over $100B money-laundering scheme". New York Post. Archived from the original on 28 June 2014. Retrieved 2 July 2014. ^ a b c d e f g Thompson, Mark and Evan Perez (1 July 2014). "BNP Paribas to pay nearly $9 billion penalty". CNN Money. Archived from the original on 7 July 2014. Retrieved 1 July 2014. ^ a b Touryalai, Halah (1 July 2014). "BNP Is Just Fine After $9B Penalty. Are Billion Dollar Settlements Effective?". Forbes. Archived from the original on 6 July 2014. Retrieved 1 July 2014. ^ U.S. Department of Justice. "BNP Paribas Sentenced for Conspiring to Violate the International Emergency Economic Powers Act and the Trading with the Enemy Act". United States Department of Justice. Archived from the original on 25 December 2015. Retrieved 24 December 2015. ^ Meyer, Henry (1 July 2014). "Putin Says U.S Blackmailed France Over Warship With BNP Fine". Bloomberg. Archived from the original on 19 December 2014. ^ GmbH, Frankfurter Allgemeine Zeitung (30 July 2017). ""Mistrades": Der 163-Millionen-Euro-Mann?". FAZ.NET. Retrieved 30 October 2017. ^ "Arroganz der Banker kotzt mich an: Armin S. verklagt Großbank auf 163 Mio. Euro". FOCUS Online (in German). Archived from the original on 30 September 2017. Retrieved 30 October 2017. ^ Jäger, Jörg Engelbert (22 May 2017). "Daytrader verlangt von BNP Paribas wegen Preisirrtum 152 Mio €". DIE WELT. Retrieved 30 October 2017. ^ "Un trader réclame 161 millions d'euros à BNP Paribas". lesechos.fr (in French). Retrieved 30 October 2017. ^ a b Online, FOCUS. "Bank-Irrtum zu seinen Gunsten". Archived from the original on 8 July 2016. Retrieved 7 July 2016. ^ "Un trader réclame 161 millions d'euros à BNP Paribas". lesechos.fr (in French). 11 March 2017. Retrieved 11 March 2017. ^ Lusk, Michael. "Do banks' internal control systems work?". Archived from the original on 27 December 2017. ^ S, Armin (15 September 2016). "Auf dem Papier Millionär" (PDF). Auf dem Papier Millionär. Archived (PDF) from the original on 16 September 2016. Retrieved 15 September 2016. ^ "Daytrader verlangt von BNP Paribas wegen Preisirrtum 152 Mio € - WELT". DIE WELT. Retrieved 26 May 2017. ^ Binham, Caroline (9 March 2018). "BNP Paribas failed to book trades in Germany for a week". ft.com. Archived from the original on 17 March 2018. ^ "ArminS vs BNP Paribas". 26 September 2018. ^ Matussek, Karin (11 January 2019). "BNP Faces New Front in $188 Million 'Fat-Finger' Suit by Trader". Bloomberg. Retrieved 11 January 2019. ^ a b "All the information about the BNP Paribas Foundation - BNP Paribas". Archived from the original on 13 September 2016. ^ "Standard Ethics Italian Index". Archived from the original on 3 April 2016.